Caledonian Uprising returns for the 9th year! One hundred 40k players, one hall and one Champion! 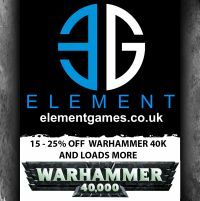 40k Singles event fought over two days at the Element Games North West Gaming Centre in Stockport. ETC missions and scoring. Free Car parking can be found at the venue and next door in a free Council car park. There are local shops and Takeaways within walking/driving distance if you want to bring or order food in (like during the evening social). The venue is a Licensed Premises and as such no outside drinks, with the exception of water, may be brought into the venue. Davenport train station is the closest at a 10-15 minute walk but the main Stockport Station is also only 20-25 minute walk (and you’ll find more frequent trains). You can get the bus from Stockport Station for less than £2.00 each way. And the Bus stops at the end of our road – opposite Premier Inn and is a 2 minute walk. If after this time you find you can’t attend we won’t be able to process a refund for you as food, venue space and prizes will have been bought and paid for. We will start a Reserves list and try and help you sell your ticket onto one of the Reserves.